Did You Ride to Work today? Did you Ride to Work today? I leave for work at 6:15 a.m. and don't see many motorcycles on nice days, today I saw no motorcycles on my route. I guess the rain kept them home. To all those St Louis motorcyclist that did ride, GOOD SHOW. Does this motorcycle make me look fast? That's what I thought too. Is a Buell motorcycle in my future? I'm not sure, but I can certainly see the appeal in one. Maybe I should have said I can FEEL the appeal in a Buell. Today I took the pictured Firebolt XB12R for a short test ride, courtesy of the fine folks a Mid-America HD in Columbia, MO. (Thanks for moving half dozen bikes just so I could ride the 1200). I was hoping to find a Lightning or a Ulysses but they seem to be in short supply. The Firebolt has a tucked in sport riding position, that can get tiring in a very short time. When I got back on my bike I felt like I was sitting in a BarkaLounger. Though the riding position doesn't suit me, the The torque produced by the 1200cc engine does. A few years ago on some motorcycle TV special a woman said that "Harley's don't vibrate, they throb". This Buell is no different, start it up and it throbs so much it can give you motion sickness, but give it some gas and that throb changes into a big smile on your face. Yes I had a grin from ear to ear on my big fat head when I got back from my ride. 250 miles for Taco Johns? I know what your are thinking. Why spend half a day and 7 gallons of gas to eat at Taco Johns, Why? The short answer, for the same reason I ate the middle of a chocolate cake for supper, because I can (it doesn't hurt that my girls are on extended travel). This whole affair is wrought with questions. First why in the world would I chose to eat at Taco Johns? Because the nearest Taco Tico is a 500+ mile round trip and I didn't decide to go out for lunch until 11:30 a.m. I know, I know I still didn't answer your question, why Taco Johns or Taco Tico for that matter? The ride. It has been a few years since I last traveled up Missouri Highway 79, and that was in the car chasing trains, so I had forgotten how straight and flat it is up to Louisiana. I saw lots of biker types (Harley's, Metric cruisers) but not much else on two wheels. The only time I leaned the bike was to avoid the vast amount of roadkill. There are better, more enjoyable roads to travel but I was hungry. 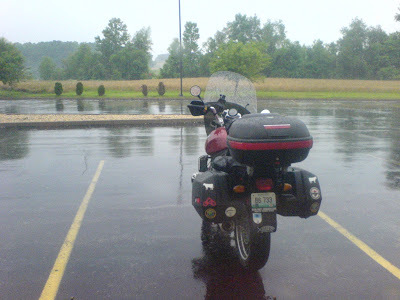 I crossed the Mississippi River at Louisiana and had another flat and straight 30 miles up 54 to Pittsfield, Il. I arrived at the Shell gas station/Taco Johns at 1 p.m. I had 2 tacos, a burrito and a diet Coke. I thought about getting a bag of taco's for supper but in my rush to leave home I didn't put my sidecases on the bike, and as much as I like Taco Johns I didn't want to leave my cameras in Pittsfield. Leaving I took Illinois 106 northwest through Hull to I-72 and crossed the Mississippi into Hannibal, MO so that I could ride the more motorcycle friendly part of MO 79. The ride south from Hannibal wasn't as pleasing as I remembered. The road was fairly rough with lots of tar snakes. I did stop at one of the scenic overlooks to snap a photo. Taco Johns was perfect, or as perfect as it can get. It felt good to put a few miles on the bike in one sitting, most of my riding these days consist of my 50-a-day commute, but the path I choose was less than perfect. I think I will do lunch at Taco Tico next time. St Louis, MO to Louisville, KY isn't to far for lunch, it it?